The call is intended to foster multinational cooperation in sustainable chemistry. All researchers working in the field of sustainable chemistry and eligible to apply for financial support from their respective participating national research councils, are invited to apply. This program is designed for small teams of three or four principal investigators, encompassing three countries. While larger teams may be considered, it is incumbent upon the team to articulate a clear and strong plan that optimizes both scientific coherence and effective management of resources. Each team will submit a single, joint proposal. successfully address a significant environmental problem. 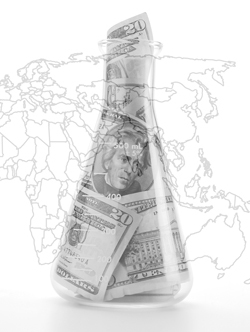 This grant program does not support (i) basic research that focuses on biological techniques, cellular processes, or biomedical problems; (ii) applied research that focuses on extended solids and bulk materials; (iii) design, optimization, or other engineering aspects of devices; (iv) engineering aspects of chemistry, such as scale-up, processing, transport dynamics, and long-term stability. Letters of intent are due 1 February 2013. Full proposals for eligible projects are due 29 March 2013. Final results of this call will be communicated to applicants by 30 September 2013. Funding of all awards will start no later than January 2014. The call is coordinated by the IUPAC Division of Chemistry and the Environment. Questions can be addressed to the call secretariat at proposal@iupac.org. Guidelines for Applicants are available at the IUPAC Call web address <www.iupac.org/news/news-detail/article/international-call-for-proposals-in-sustainable-chemistry.html> and at the relevant partner websites. Page last modified 8 January 2013.